The Bulls Tuesday, appropriately enough, closed out a year that wasn’t the least bit Rosy. They did so in a lamentable 85-79 loss to the Toronto Raptors in which they once again failed in the end because they had so much difficulty making shots and offensive plays, finishing strong at the basket and producing any open court, easy baskets. Basically everything that defined Derrick Rose’s game. The last year for the Bulls was the story of Rose’s attempted comeback and then shortened return. So counting on Rose to return with his MVP flash and unique offensive abilities, it’s difficult to create another team that can duplicate the things he did, which were special and unique in the sport. “We’ve shown we can score. 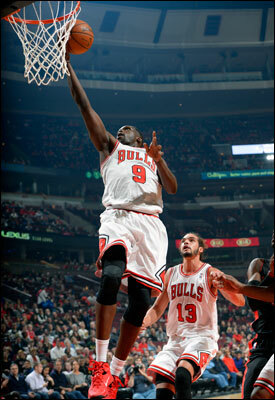 I just thought tonight we were out of rhythm a little bit,” said Deng. So the Bulls dribble toward a conclusion for this group, hopeful it holds one more season of unlikely and fulfilling moments. Though for now it’s difficult to discern as even with Luol Deng back Tuesday from an Achilles injury to complete their best starting five without Rose, playing at home even if it was the second of a back to back and facing a sub-.500 team even if the Raptors do lead the Atlantic Division, the Bulls could not score 80 points and withered in a miserable four of 24 shooting fourth quarter. “The end of the third we were not very good. The fourth quarter has to be your best quarter. The fourth quarter is different,” reminded Thibodeau. “It requires a different intensity. Your decisions have to be quicker. I thought we had a lot of plays in the paint we just have to finish stronger. We can’t just flip the ball up there. We’re capable of doing better. The Bulls did let down some at the end of the third quarter when they were on the verge of putting Toronto away with a 56-47 lead. The Bulls’ defense was again terrific, Kirk Hinrich and Jimmy Butler taking the high scoring backcourt out of the game and Joakim Noah again thwarting the inside. These Bulls players continue to play as hard as any in the NBA. But they basically lack too many skills, and it showed again in the New Year’s Eve game. When Rose is there, like Michael Jordan in the 1990’s for another mostly offensively challenged team, he can cover up a lot of the weaknesses. Basketball revolves around unifying parts, which is why the analytics so popular in baseball don’t have near as much substance or significance in basketball. When Rose is on the court, the defense has to react to him, stretching out, especially as he developed more shooting range. It provides better shots for other players, the ability to square up when you shoot rather than having someone with a hand in your face or having to manufacture a shot off a screen and shoot on the move. This group of Bulls players, actually especially the starting group—and that makes sense as they are accustomed to functioning with Rose—has more difficulty on offense without him. Even as Deng noted the Bulls have had high scoring games and all the players have made big plays and shots, there isn’t a natural scorer in the group, especially with Carlos Boozer now later in his career. And that was most apparent in a game like Tuesday’s when the scoring was so badly needed. The Bulls seemed to take a bit of a breath late in that third quarter and also got caught a bit when the Raptors went into a zone for a few possessions. That enabled Toronto to pull within 62-57 after three. And then the Raptors buried the Bulls with 21-4 start to the fourth quarter in which Gibson shot two air balls, Deng missed a few pull ups along with Hinrich and the Raptors were mostly shadowing Mike Dunleavy. “Offensively, we have to get into a rhythm. 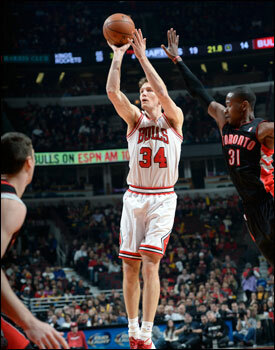 I liked the way Taj (Gibson) and Mike (Dunleavy) played (25 points combined on 11 of 21 shooting),” said Thibodeau. The true post-Rose starting unit of Deng, Hinrich, Boozer, Noah and Jimmy Butler really doesn’t have a shooter in the bunch. Boozer may be the best, though not from distance. He had a brutal game with one of eight for four points as he went back to mostly fadeaway jump shots instead of attacking the basket as he did in the win at Memphis Monday. New Year’s resolution: Boozer dunk more and work with Gibson on his jump shot. Deng: Go back to the three-point line. Hinrich was one of nine for four points, though most of his shots came late and seemed forced in the desperate bid to get back in the game. The Bulls actually did get back with a chance after trailing 80-70 with 2:17 left. Noah got fouled on a second tip attempt—the Bulls had to miss a dozen tips and layups—and made two free throws. The Bulls then forced a pair of turnovers and a tough jumper that missed and scored seven straight to get within 80-77 with 1:24 left on two Deng free throws. But the Bulls fouled DeMar DeRozan, Jimmy Butler forced a pullup with little offensive movement, John Salmons accommodated with a pair of missed free throws, but Deng missed close and the Raptors closed it out with free throws. It’s understandable Deng, with a team high 16 points on six of 15 shooting, would not be sharp after missing so much game and practice time as it was an injury that didn’t allow him to practice. Butler added 15 points, but the starters shot a combined 15 of 55 in 157 minutes while the reserves shot 15 of 27 in 81 minutes. Reserve production hasn’t been great for the Bulls because so many reserves were starting with the injuries. But the Bulls on the last day of the year were able to return to something of a rotation with the five regular starters without Rose back. It was just the second such game all season. That group plays wonderful defense. Hinrich has been little short of amazing of late defensively, catching fast breaks and blocking shots on the run and making it exceptionally difficult for high scoring guards. Noah has been all over the boards and had 16 rebounds and six assists against Toronto. Butler has slowed down the best scorers. But when they play together they tend to be reluctant shooters. Deng and Butler are slashers; Noah prefers to play the high post and pass, often stuck with the ball late in the shot clock in the Bulls continually deliberate sets and then running down the left side for some sort of hook shot. Hinrich has preferred to move the ball on. Thibodeau usually has Gibson with that group late, but when he missed early in the fourth Thibodeau gave Boozer a try. He was searching for offense, but Thibodeau still was reluctant to try rookie Tony Snell. Snell’s three point shooting has shrunk of late to 31 percent. But he isn’t a good option with more defense needed when trailing. Butler scored 15 points, but the starters shot a combined 15 of 55 in 157 minutes while the reserves shot 15 of 27 in 81 minutes. The Bulls best shooters have been Augustin and Dunleavy. The problem has been when they have to play against first line scorers. Neither is a high level defender and teams tend to go right at them. It was the Catch-22 situation Thibodeau got caught in late in the game. His starters couldn’t shoot or score. But he needed defense for those shots to matter. So he had to stay with Deng, Butler, Noah and Hinrich. They did their job, but they don’t stretch the floor. When those players were on the floor, the Raptors tended to sink into the lane. Thus making those passes to cutters more difficult and resulting in turnovers. The ball flowed better with Augustin and Dunleavy playing in that second quarter because now the Raptors defense had to come out because of the threat of the long shots. Thus the court opened and it was easier to pass and make the cuts. But that group doesn’t defend as well. Thibodeau did a good job of working Deng and Noah in with them. And that’s perhaps something he’ll have to do more of going forward. But Thibodeau is reluctant to go away from the inside power game with Boozer and Gibson that has worked in the past and fits with the team’s defensive style. No, it’s not the perfect roster. It was a slow start once again for the Bulls with more turnovers than field goals in the first 10 minutes. But the Bulls were holding the more athletic and higher scoring Raptors down and trailed 21-16 after one quarter. Then that Bulls second group with Gibson having a huge quarter and Augustin and Dunleavy hitting from outside pulled ahead 42-36 at halftime. The Bulls with their defense were controlling the pace as center Jonas Valanciunas would lead Toronto, 14-15, with 15 points. The Bulls fell to 12-18. 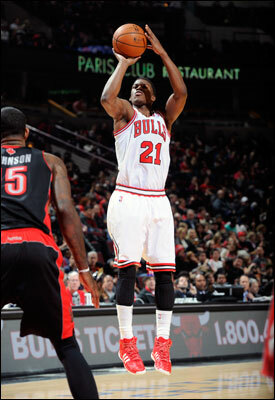 Butler made the Bulls second three of the game (in nine attempts) and Hinrich added a pullup. The Bulls seemed in charge with a 56-47 lead with five minutes left in the third. But whenever the defense rests just a bit it becomes too difficult to produce offense. And then if Thibodeau goes to the offense, the opposition takes advantage. It’s why it’s so vital for this Bulls group to play with an early lead, as it did in Memphis. But this time it just got away when there was no one to blame because the energy and effort were there. If not the results.